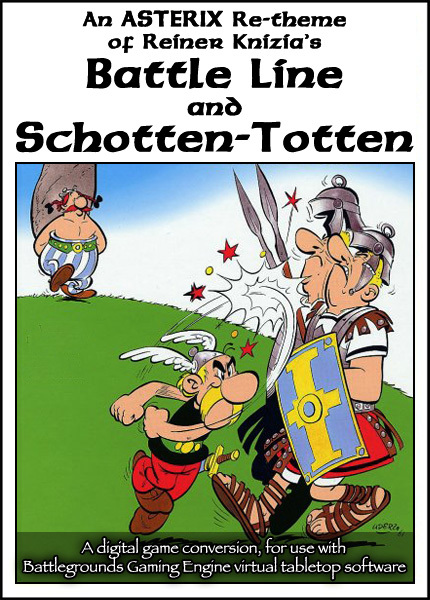 This is a BGE digital conversion and Asterix re-theme of the "Battle Line" card game and the "Schotten-Totten" card game, both by Reiner Knizia. Nine Roman Legion cards lie between you and your opponent. In front of each Legion, you each place troop cards to build poker-like "formations" of three cards per side. Whoever plays the higher-ranking formation defeats the Legion. Successfully defeat five Legions, or any three adjacent Legions, and you win the game. The above download contains everything needed to play the game if you already have at least one Gamer Client license (BGE v1.0 or higher). The host's opponent will need either a Gamer Client license of their own, or they can use the free BGE Demo, since the host always has at least one free Player Slot available. "You couldn't ask for more in this tight, tense, genius of a 2-player filler." "One of the best two-player card games out there. Although luck plays a part, it usually is the better player that wins. Tons of replayability here." "I go back and forth between this and it's cousin BATTLE LINE as the best 2-player game in existence." "Fast game play, with lots of strategy and tactics. Simple rules. High tension from the beginning on; knowing what to hope for and when to commit cards on the board is hard." "Strategic planning with tough decisions, bluffing, and a bit of card counting & deduction packed into a short playtime." "Similar to Lost Cities in some ways but more satisfying after a win and a much better game. Very simple for non-gamers to grasp." "Simply a masterpiece of 2-player card playing. Elegant simplicity. Games are quick, but intense." "I've taught Schotten-Totten to many friends and gamers, and every one of them has asked to play again immediately." "A very nice and clever game for two players, quick but intense, where each decision matters and can make the difference between a win and a loss, while the luck of the draw plays a minor role." "Vintage Knizia; simple rules deliver surprising depth of game play. Tough decisions abound." "Battle Line is a "gamer's" version of this game in that it adds a mechanic in which you can affect your opponent's side of the table. That being said, I often find myself very much enjoying the (relatively) simpler play of this version of the game." "It melts your brain and twists your guts." "Great game. Very, very simple and yet always nail-biting and always leaves you with some agonizing decisions." "This game has some of the same feel as Lost Cities, but with more depth and options." "Best two player game I've ever played. Quick, tense, and fun." "Outstanding card game. It's got bluffing and press your luck elements. There is plenty of strategic and tactical depth for such a quick game. The fine balance between revealing what your plans are, and holding back is quite intriguing." "This is a brilliant card game. Lots of cool nuances than appear after repeated plays. I'd suggest playing without the Tactics cards at first to get a handle on the "basic" game. Extremely easy to learn and get going quickly (especially if you are familiar with Poker rules.)" "What an incredibly simple, yet fun game! Reminds me of Lost Cities, but with much more strategy. I love choosing between drawing more Troops or Tactics cards." "Everybody plays to win in Battle Line. No matter how amiable a game may start, it always ends with desperation and exaltation. I love it." "I really like the ebb and flow of this game. You start out with high hopes, aiming for strong positions, and then start scrambling, trying to make the most of an always imperfect situation." "Knizia. What can I say? The man's a genius." "The more I play this, the better it gets. Surprisingly deep strategy, including bluffing and feints. Plenty of opportunities to screw up and redeem yourself." "I love games with lots of tension and agonizing decisions, and this game has both in spades. Luck of the draw is always a factor in card games, but this seems to have the perfect amount of depth/strategy for the playtime."